Question - What do you mean by the term 'Alliance Marketing'? Everyone knows one plus one is equals to two, but sometimes it is equals to eleven, synergy between the forces makes it possible. Synergy is the interaction of two or more forces so that their combined effect is greater than the sum of their individual effects. In business two or more organizations comes together to produce some kind of synergistic effect or result. Similar happens in alliance marketing where two or more organizations jointly undertakes marketing activities. Alliance Marketing is marketing activity undertaken by two or more organizations, jointly to promote product, service, or concept with the purpose to provide benefit to all the stakeholders. Alliance marketing involves pooling resources like - expertise, brand reputation, distribution infrastructure, or money, to produce an effect/result which would be more difficult and costly to achieve independently. 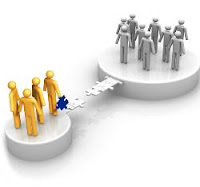 To gain access to a non-competitive businesses' customers - Businesses not competing with each other can promote one another, they can refer customers back and forth to increase their sales. To pool knowledge, expertise, and resources - Pooling expertise, resources, and efforts reduce inefficiencies and expenses. To expand into new markets - Independent expansion requires heavy investment, resources, and development of new distribution channels. Alliance marketing makes it easy, a firm in one country can offer a product through another firm already established in another country, thus expand into new market immediately. For an alliance to work all the involved parties must work closely together to create business. The alliance/relationship must be communicated well to all the stakeholders. The greater the stakeholders' understanding of the value of the alliance, the more they can contribute to its success.